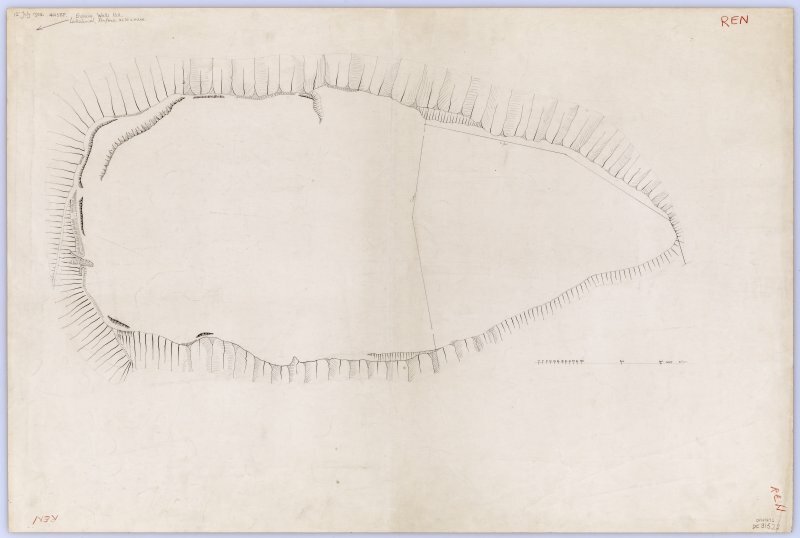 Plane-table survey: fort at Walls Hill (redrawn from three sheets). 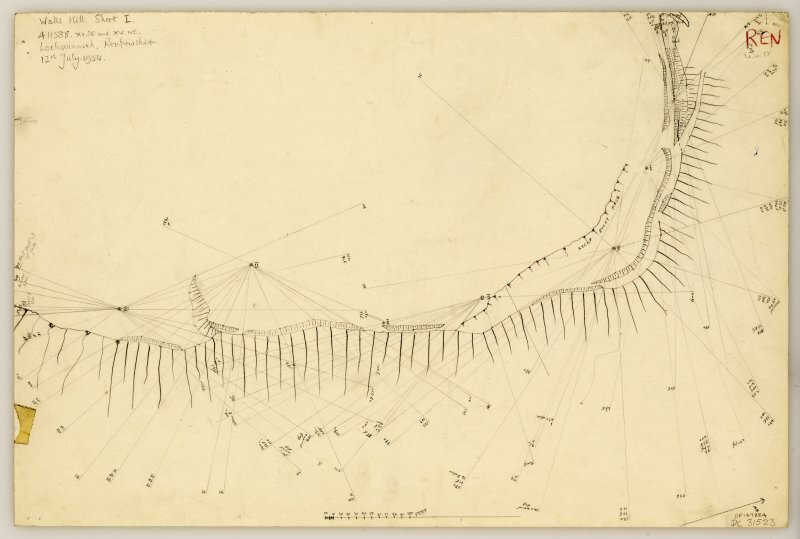 Plane table survey plan of fort at Walls Hill (sheet 1 of 3). 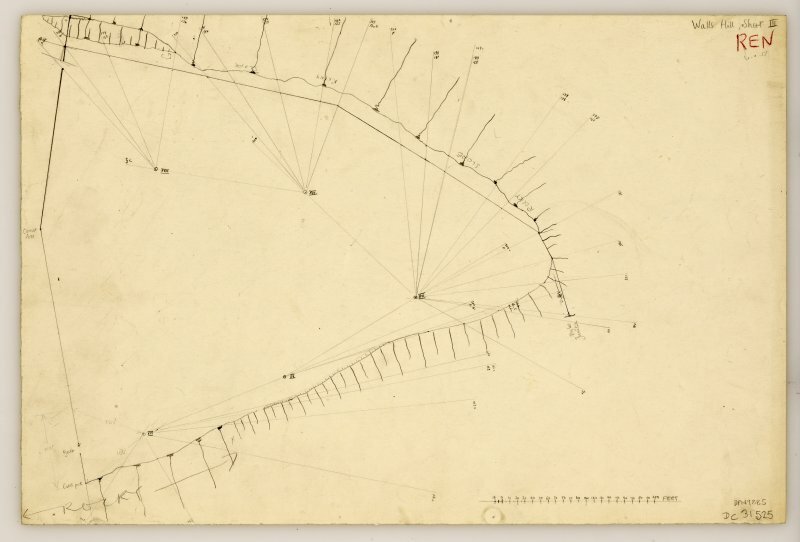 Plane table survey plan of fort at Walls Hill (3 of 3). 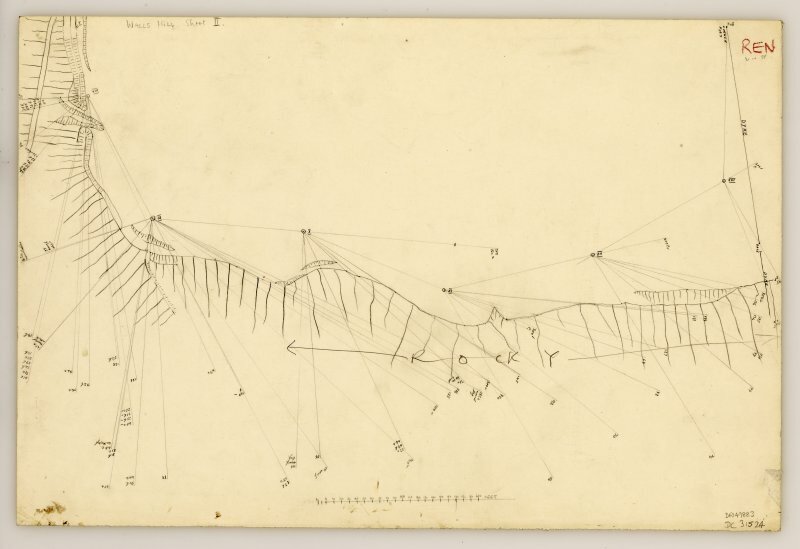 Plane table survey plan of fort at Walls Hill (sheet 2 of 3). 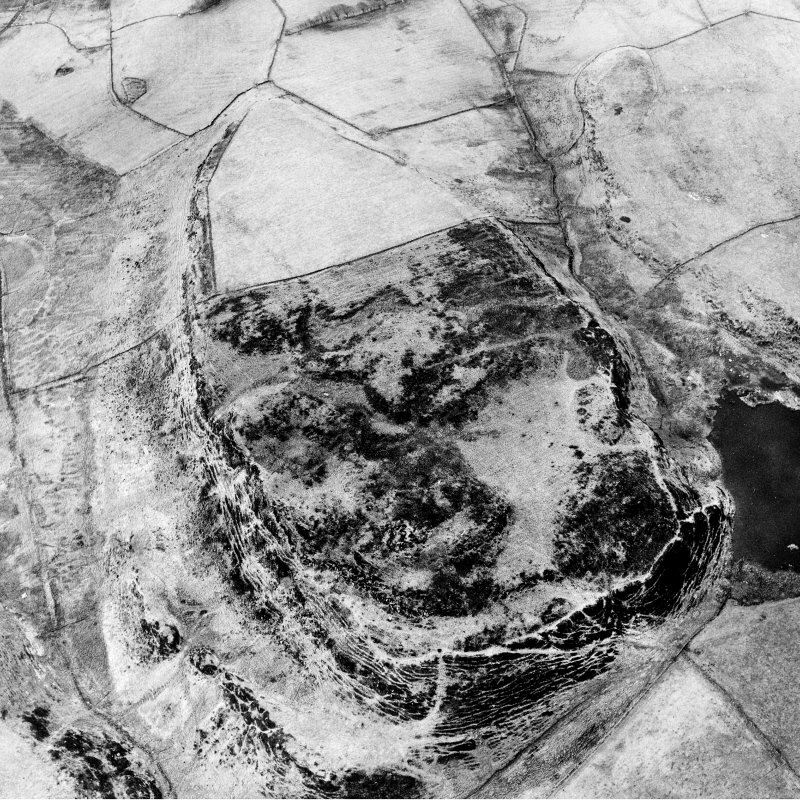 Aerial photograph of Walls Hill fort. Digital image of RE/1458. 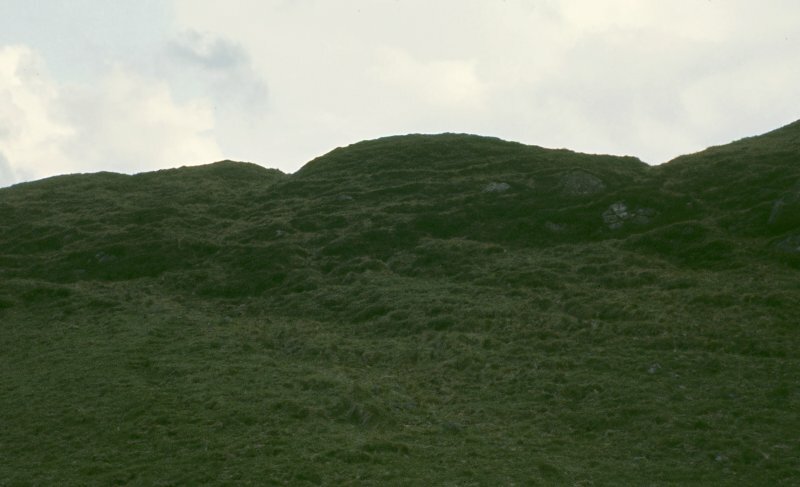 The summit of Walls Hill, a steep-sided rocky plateau, 1540' x 650', is occupied by a fort, walled settlement (R W Feachem 1965), large enough to be considered an oppidum of the Damnonii. The rampart enclosing the summit was of earth, with stone kerbs, probably furnished with a timber revetment at the front. It had been reconstructed at least once. There are no surface traces of dwellings, but excavations in 1956 and later years revealed the foundations of circular, timber-walled huts, one of which produced Early Iron Age pottery. Newall states that it was probable that the initial occupation of this site ended with the arrival of the Romans. However, his excavations showed that somewhere between the first and fourteenth, very possibly between the fourth and eleventh, centuries, the site was re-occupied. 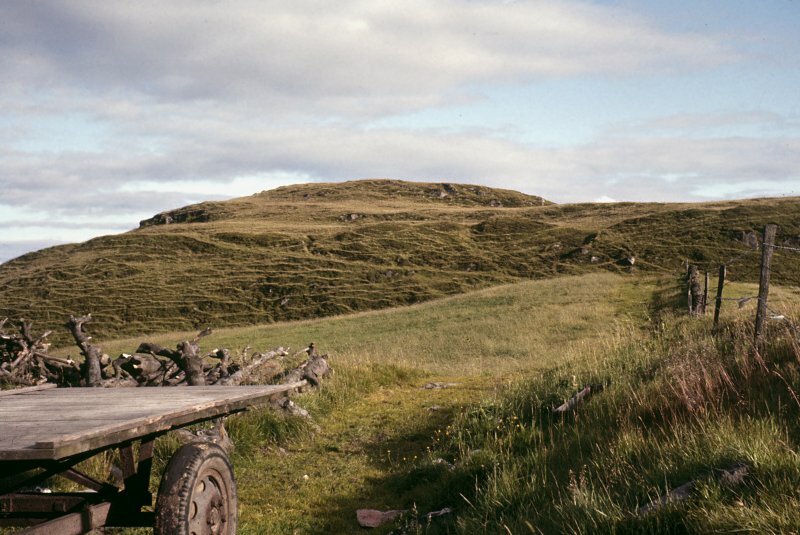 A final occupation took place in the 14th century, when a farm house was constructed. This fort is generally as described. The rampart is only evident on the N and SW sides. No internal features were noted save for the low bank from the centre of the fort to the E side. Newall's terrace area on the NE side of the hill appears to be entirely natural. No traces of former occupation were noted. The finds from the excavation are in Paisley Museum (no accession numbers). A struck flake of green flint was recovered from a runnel just outside the main entrance to the fort in 1970 by A S Newall. In 1977, a rim fragment of a large cooking pot of coarse grey-black clay was found; it is on loan. F Newall 1970; DES 1977. 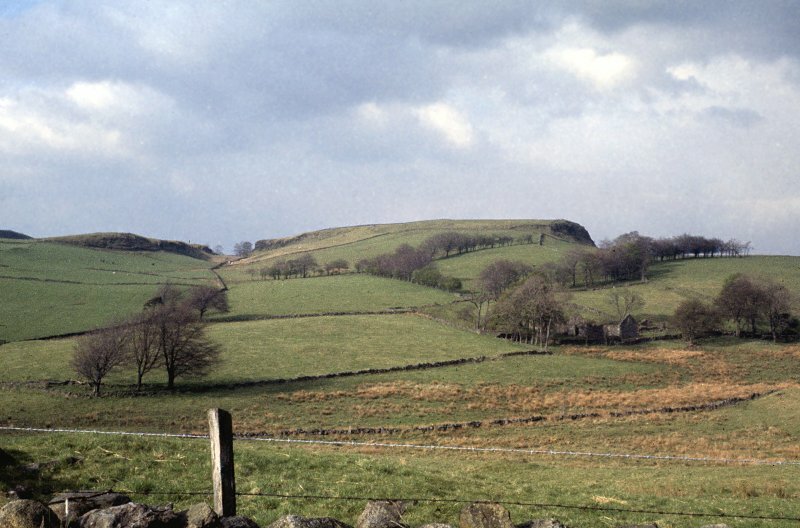 The face of the country in the area E of Lochwinnoch and S of Kilbarchan is characterised by numerous isolated outcrops and by irregular hills and knolls the flanks of many which are rocky and precipitous One of the most conspicuous of these is Walls Hill, a flattish, oval feature which lies between North Castlewalls farmhouse and the ruined steading of South Castlewalls. The summit area, which attains a height of 750 feet O. D., measures about 1,600 feet from N to S by about 700 feet transversely. It is bordered for the most part by steep rocky slopes and cliffs between 20 feet and 30 feet in height, except in the SW where it is connected to the adjacent land by a slight grass-covered slope. The remains of a rampart border most of the N end of the plateau and can be traced in places along the N parts of the E and W sides. 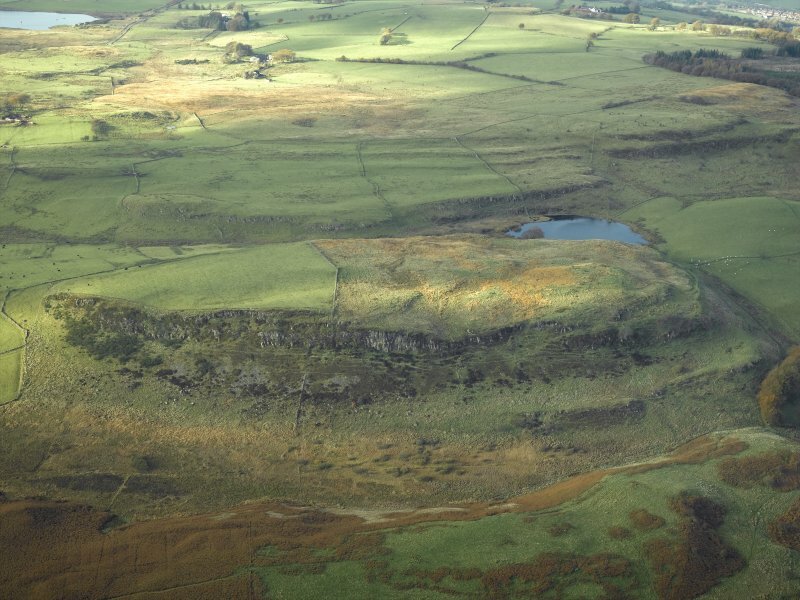 They probably represent the remains of a continuous rampart which originally bordered the whole of the plateau. The S half of the latter is comparatively level and has been under intensive cultivation, while parts of the N half, which is more uneven, have been ploughed and drained. It is difficult, however, to see how these processes could have destroyed much of a rampart which, for most of its length, ran along the brink of steep slopes and cliffs and would, indeed, have served as a field boundary. Its absence for so much of the presumed course must rather be due to the natural effects of erosion and collapse and to robbing. Along the N end of the summit plateau the rampart consists of a grass-covered, stony mound spread as much as 17 feet in width. The height from the inner bottom to the crest is only a few inches, but that from the outer bottom is up to 2 feet. At half a dozen places rocky ridges which lay on the course of the rampart have been quarried away both to admit the rampart and to provide material for it. This work is on a considerable scale. An entrance through the W part of the N sector consists of a gap in the rampart 20 feet in width through which a deep and steep hollow runs up from the slope side to enter for a distance of 30 feet into the enclosure. The rampart is breached again at a point 200 feet to the E by a modern agricultural track which rises slowly upwards across the N face of the hill, crosses the rampart obliquely and carries on for some distance between the latter and the quarried rock which here lies parallel to it for a distance of 200 feet. 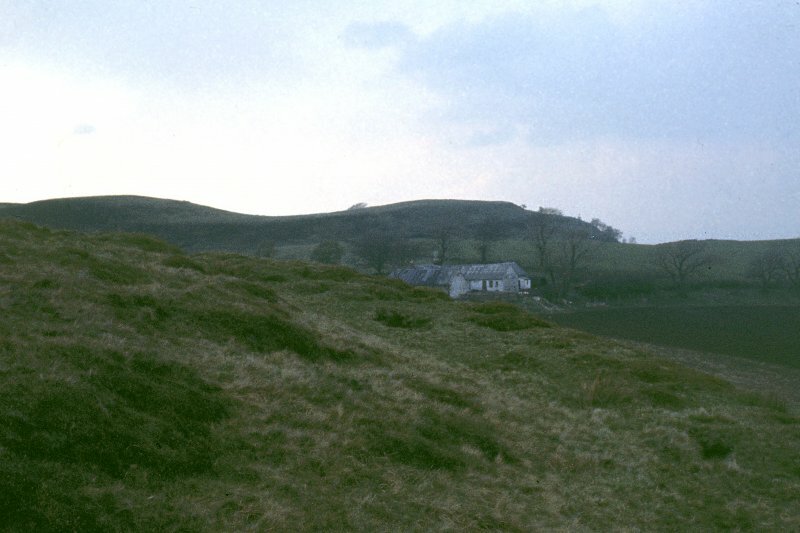 If it is assumed that the whole of the summit area was originally enclosed by the rampart, the structure thus formed would be the largest hill-fort in the district. It might have been expected that, in spite of cultivation and the presence of coarse grass and heather some traces of internal structures would be visible, especially as considerable parts of the surface of the N part of the plateau are sufficiently irregular not to have been ploughed but are none the less perfectly suitable for hut sites. Although no such structures were visible on the date of visit or on the air photographs (541 A/471, 4009-10), huts have since been discovered by excavation. 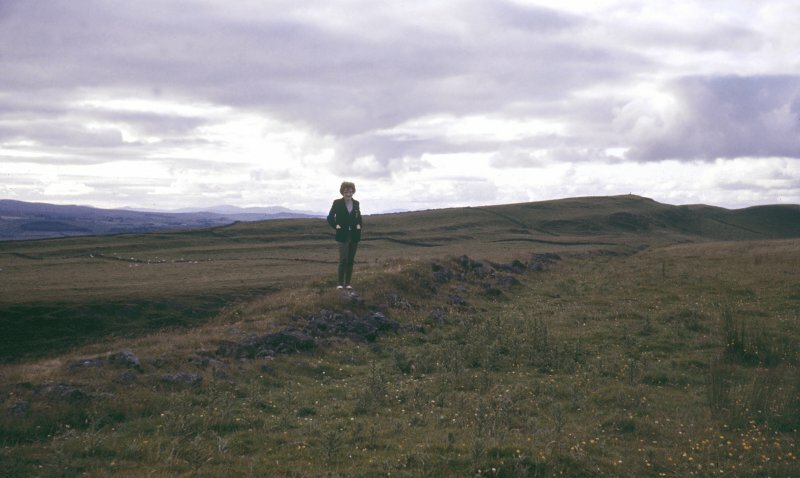 The probability that the rampart was once more substantial and more extensive may be supported by the names of the hill and of the adjacent farms, North and South Castlewalls, names which would certainly not be warranted by the present remains. The situation and the extent of the existing structure (cf. NT72SE 10, Inventory of Roxburghshire No.299) justify its being described as a fort, but the possibility that it represents a town or oppidum cannot be ruled out. 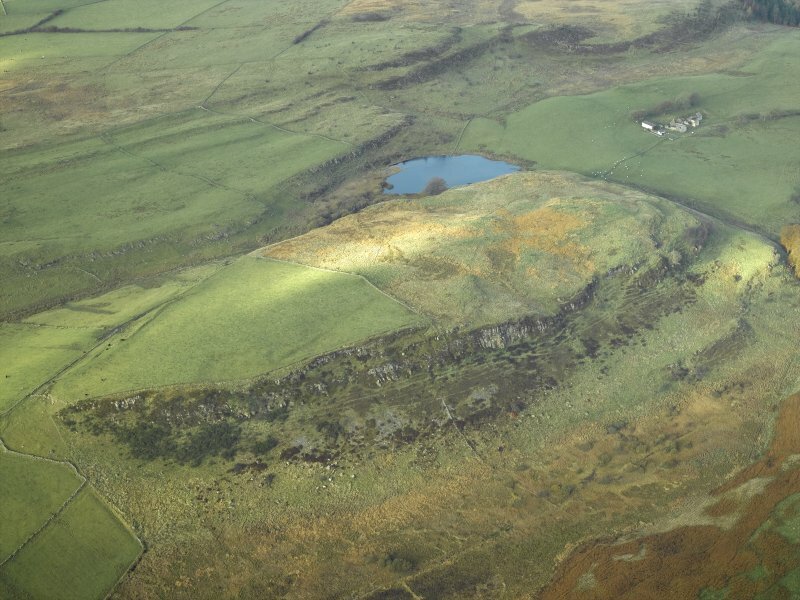 This exceptionally large fort occupies the summit (230m OD) of a steep-sided lava plateau which, except on the north-west where it is overlooked by higher ground, dominates the surrounding fannland and forms a prominent local landmark. Roughly oval on plan, the fort measures 460m by 200m within the much denuded remains of a single stone-faced rampart which has been drawn around the lip of the plateau. The southern third of the intelior has been cultivated and the defences largely removed, but on the north considerable stretches of the rampart remain, measuring up to 3.5m in thickness by about 1m in height. Only one original entrance passage is now visible and this lies on the north-north-east a short distance to the east of the point where the track from the farm breaks the rampant. No houses can be seen in the interior but excavations in 1956 revealed fragments oflate iron-age pottery and pieces of worked jet or shale. Walls Hill has attracted much attention as one of the largest pre-historic enclosures in Scotland, at about 7.5 ha being exceeded in area by only three other forts. Some writers have likened it to a Celtic oppidum (a large defended late iron-age town found in southern England and on the Continent) and have suggested that it is the capital of the local tribe, the Damnonii, but more excavation is required before such a suggestion could be verified. For a site of that importance the defences are very slight and were the enclosed area smaller it would hardly merit the status of a fort at all. 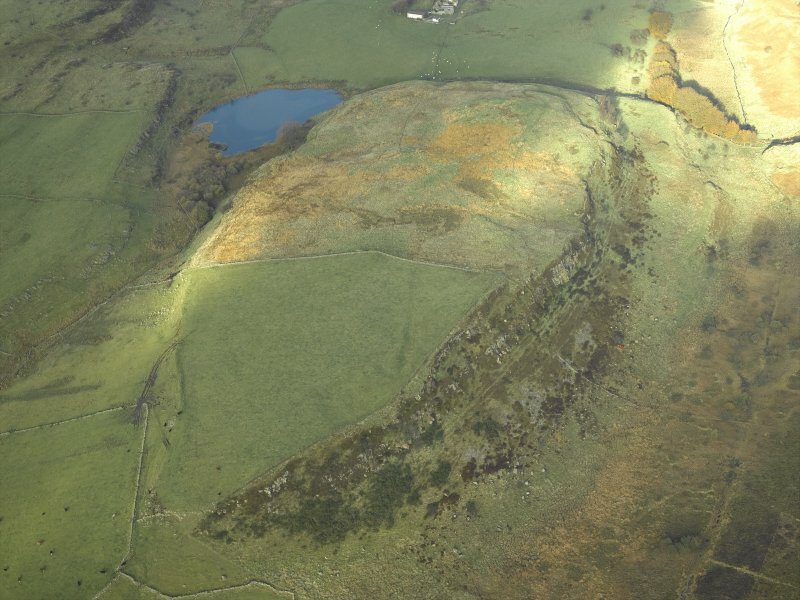 Several other hilltops in Renfrew and north Ayrshire are also occupied by large, poorly defended enclosures and it is possible that Walls Hill is simply the largest example of a localised type of ironage (or earlier) enclosure which we have barely begun to understand. This large fort is situated on Walls Hill, a long whale-backed ridge girt with cliffs along large sectors of its flanks. The defences are best preserved at the N end, where a single rampart spread about 5m in thickness and no more than 0.6m in height externally can be traced along the crest of the slope and onto the cliff-edges on the E and W respectively. Elsewhere little trace of it can be detected, though about 1837 Andros Crawfurd noted that at the southern end of the fort it stood 1.5m in height internally (Newall 1960, 6), presumably in the sector on the SW where the 1st edition OS 25-inch map (Renfrewshire 1863, sheet 15.3) depicts its line along the lip of the relatively gentle and accessible slope, and in places there are numerous stones embedded in the crest of this scarp. The area enclosed is roughly pear-shaped on plan, measuring about 450m from N to S and tapering from a maximum of 200m at the northern end to a point on the S (7ha). Two entrances can be seen at the N end, lying roughly 40m E and W respectively of the point where a modern farm track cuts obliquely through the rampart, and in both cases a deep hollow drops away steeply down the slope. The eastern of these entrances was excavated by Newall in 1956 and sections were cut across the rampart to reveal a complex structure (Newall 1960). The post-holes of two successive round-houses were excavated to its rear, where there had also been medieval occupation.